The next three articles in this series will focus on some of the types and styles of company houses found throughout the Keweenaw. The company house was, and still is, the backbone of life in this region. 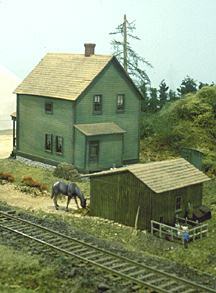 This may seem an odd subject for a publication focused on railroads, but the railroads could not function without places for the population they serve to exist.-- and a model railroad purporting to represent the area would be incomplete if it did not include company houses. a block of single dwellings and a block of duplexes. The most distinctive addition to the main structure of a Keweenaw company home is the vestibule or "snow room", which is attached to almost all houses in this region. They were meant to be a place for dirty, wet men to change before entering the main house. If you have more interest in learning about the life styles of all those mining folks then I would suggest the following books, which should still be in publication. Keweenaw Character; The Foundation of Michigan's Copper Country, by David Mac Frimodig. Cradle to Grave; Life, Work, And Death at the Lake Superior Copper Mines, by Larry Lankton. Wild Empire; A Copper Rush Adventure in Michigan's Copper Country, by Richard F. Searight. Although the latter is a work of fiction it is based on fact and is a good insight into the early days in the Keweenaw. Regarding Company houses in general there isn't much other than some PHD theses and local historical site registers in the Tech Archives, but finding them is well worth the effort. A good book on American Homes in general, which is very helpful, is "A Field Guide to American Houses", by Virginia and Lee McAlester. Today there is a small brown and white sign located off US-41 which points the way to the area once known as Ojibway. Located 7 miles south of Eagle River and 3 miles north of Mohawk, in Allouez Township, Keweenaw County, Ojibway Mining Company started operations in 1907. The town site was built a mile from the mines and located near the Keweenaw Central Railroad (controlled by the Copper Range RR) on the Gratiot River. The Ojibway was funded by a Minnesota company and the main office in the region was located in Houghton. By 1909, Ojibway Mining Co. had built 24 single family dwellings, a boarding house and two wood-framed sleeping camps to house its workers. All of these structures had running water and five had bathrooms. Electricity and phones were in place by the same year. The town site was defined by a rectangle of five streets by four streets. Of the 24 single family dwellings, 18 were of the type described in this article. 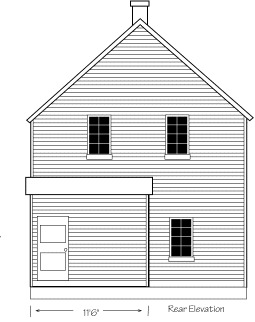 The building of company houses was a necessity in order to support a boiler house, engine house, compressor house, blacksmith shop, machine shop, warehouse, office, change house, oil house, carpenter shop and a company barn. Ore was taken from as far as Mohawk on the Keweenaw Central and transferred to the Mineral Range Railroad. The rock was stamped at Tamarack Mill on Torch Lake in Hubbell. The concentrate was finally smelted in the Dollar Bay Smelter. In 1909 the Ojibway was one of four shipping mines in Keweenaw County and showed a lot of promise. The Keweenaw Central built a station at Ojibway in 1907. The station was located between the South Gratiot and Cliff stations on the Central's timetable. It was reported to be clean and well heated, the most important consideration in this area. 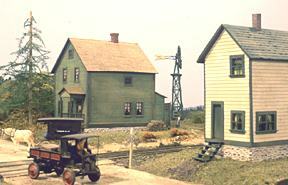 Most of the stations on the Keweenaw Central were rather small and portable, due to the fluctuation in mining activities. All of this activity just to mine for six years. In 1913 the mine closed, reportly because of bad investors, not bad ground. The town and mine location were only used until 1913 except by the watchman. In 1932 the home shown in these plans was worth $900. The entire complex was sold or stripped off piecemeal until 1941 when the whole place was sold for scrap. Some of these homes went for $35 in 1941. A gentlemen from L'anse took six of them back home with him (I haven't found them yet). This was at a time when 40 acres of fair land on which these houses sat went for $120. Ojibway, lock, stock, and barrel, went for a little over $3,000. The C&H and the Copper Range were both interested in the property. In the end it was the C&H that took ownership, but it never developed the property further. The dimensions for this structure were taken from plans found in the Archives of Michigan Tech. 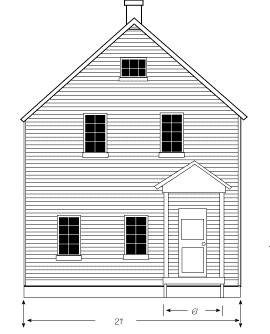 The plans were made from interior floor plans and show only the front view of the structure. I used Grandt Line windows and doors throughout. The porch spindles and posts are also Grandt Line. 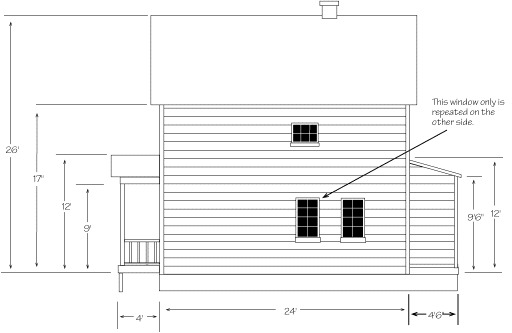 The exterior and trim is basswood (the ONLY material for wood structures), the interior walls are bristol board. The first floor contains a living room, kitchen and dining room. A hallway extended from the front door to the kitchen in the back and also contained the stairway to the second floor. The upstairs was divided into four bedrooms or "chambers" on the 1907 plan. No bathroom, but it did have a basement. Most homes that did survive the transition would have made one bedroom into a bathroom later on in the 1900's. My model has four bedrooms and an outhouse out back. In line with the Keweenaw's history, I have moved the house to Lake Mine, Michigan, after being purchased from the Ojibway mining company for about $500 in 1917, to serve as a Finnish farm house alongside the Copper Range railroad mainline.